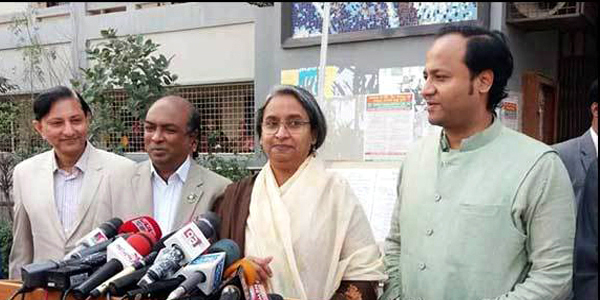 Dhaka – Education Minister Dipu Moni has warned of stern action against attempt of leak question papers as more than 2 million Bangladeshi students sat for nationwide Secondary School Certificate exam. “We want the examination will held in an atmosphere that is free of question paper leak and forgery,” the minister said calling everyone to help conduct a credible public examination. In the past years, most of the public examinations and recruitment tests are marred by the leak of question papers prior to the exams. A gang of criminals in connivance with the officials linked to the exam process has been manipulating the process to make quick money. The law enforcement agencies have busted a number of dens of the criminals linked to the leak of question papers of the public exams. Dipu Moni, who took over the charge of the ministry after formation of a new government in the New Year, is holding the first public exam after she was given the new assignment replacing Nurul Islam Nahid, the former education minister, by Prime Minister Sheikh Hasina. She visited a number of exam centres in Dhaka to see the exam on the ground. Her ministry is now on high alert to check the question paper leak, she told reporters after visiting a school in Uttara. Deputy Minister for Education Mohibul Hasan Chowdhury, Secondary and Higher Education Division Secretary Sohrab Hossain and Secretary of Technical and Madrasa Education Division Md Alamgir accompanied the minister. The Secondary School Certificate and equivalent examinations under ten education boards began in the morning as a total of 2.135 million students from 28,682 educational institutions are eligible to take part in it. Of them, according to state-run Bangladesh Sangbad Sangstha news agency, 1.07 million students are male and 1.06 female. A total of 1.7 million students participate in the SSC examination under eight general education boards while 310,172 students appear in Dakhil examinations and 125,059 participate in the SSC (vocational) examination. In 2018, a total of 2031,899 students, including 1,023, 212 boys and 1,008,687 girls took part in the SSC and equivalent examinations. Eight overseas centres will accommodate 434 students to appear in the SSC examinations this year.